Check out this haul I got this morning at a local estate sale for $50!!! I’m still trying to figure out more on the Sargent Square. 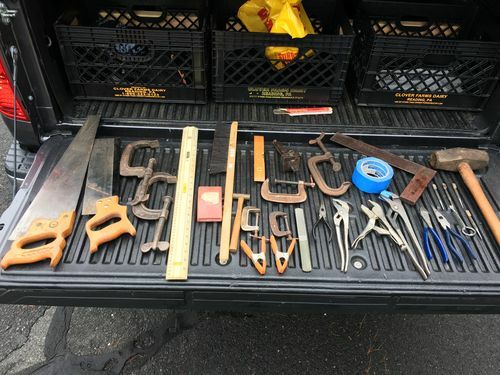 Does anyone have any knowledge on the quality or value of any of these tools? There are plenty more of these types of things. Is there anything I should go back and look for? None of those are valuable on their own as far as I can tell, but if you need them and will use them, it was a good deal for $50. 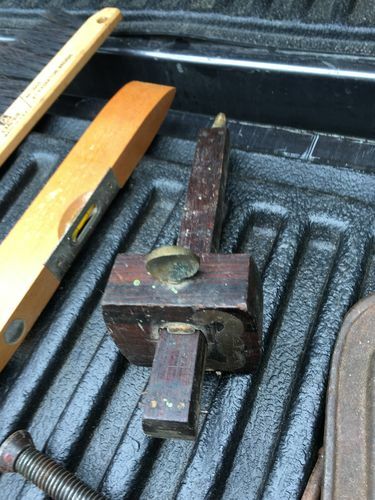 The marking gauge should clean up nicely and the try square is a larger size that can be useful. Those c clamps are probably worth $50 by themselves. Really? I’ve picked up a bunch of those larger ones for a dollar or two each and have enough so I pass them by fairly often now. Hmmm … $50 for those C clamps? I think I’ll be changing my occupation and opening up a C clamp online store. Hmmm … $50 for those C clamps? I think I ll be changing my occupation and opening up a C clamp online store. ive seen guys go bonkers at auctions bidding on those and pipe wrenches. prices end up higher than the same brands could be bought new. Really? I ve picked up a bunch of those larger ones for a dollar or two each and have enough so I pass them by fairly often now. The guage is 35-50 so you done good. 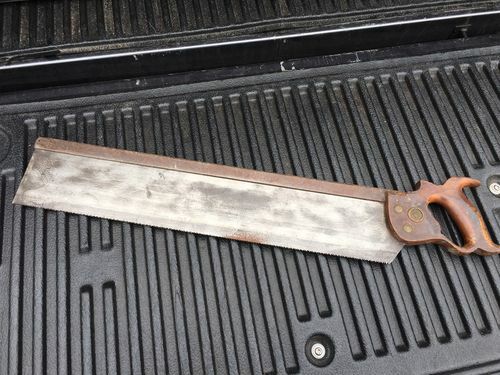 The sears-logo’d backsaw is newer, but still unusual. 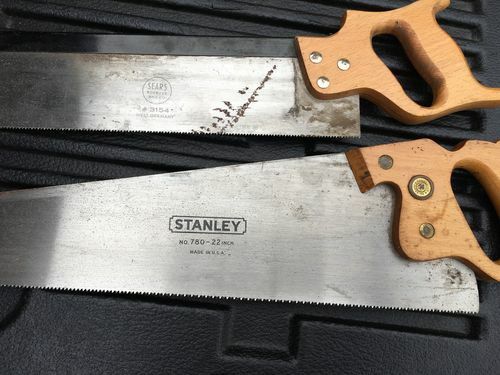 And the stanley panel saw is easily a 5$ tool. Bottom line: you’re happy. A solid score. Not only were the tools a steal, but you are in de facto in possession of stolen property, i.e. those milk crates. Seriously, bring them back to a store. I don’t know about their actual value but those c-clamps with the winged ends are great quality if they’re the same ones I have. Mortise gauge looks nice. Clean it up a bit, it’ll be a pretty user. Try-square is cool but check it carefully. I have the same one I got in a box lot and it’s WAY out of square. All-in-all, a fair buy for $50. 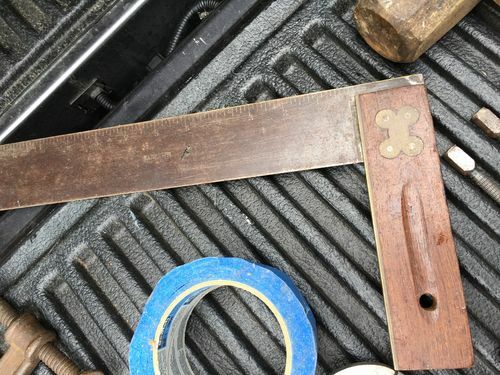 One thing to watch for if you take apart the mortise gauge for cleaning. There may be a disc between the thumb screw and the bar/shaft. Don’t loose it. Went back today after doing some research and got this Henry Disston miter saw. According to http://www.disstonianinstitute.com/medallionpage.html and the meddalion it was made between 1896-1917. That handle looks to be perfect, too. Very nice.